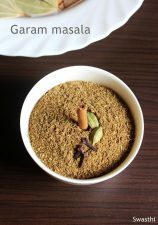 Garam masala recipe – Learn how to make garam masala powder at home with step by step photos. 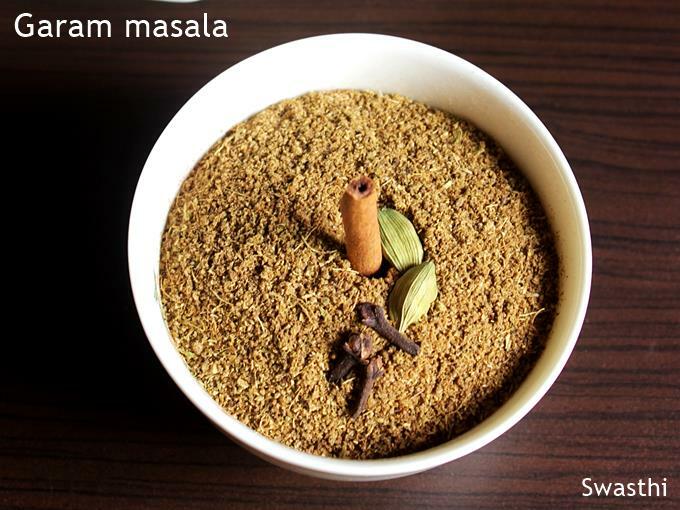 Garam masala is a mixture of ground spices used in preparation of Indian foods. The choice of a good garam masala powder is a matter of personal taste and liking. Some like it hot, strong and pungent. While some like it mild like this Simple masala which is best for every day cooking and is suitable to all including kids without leaving us dehydrated. Ready made, packed garam masala powders are preferred by most working women. But these are fairly simple to make at home. Further it may take only 10 minutes apart from the sun drying or roasting. We do not know what actually goes into the ready made packets. There are days when I am very busy with my young kids. I barely have any personal time, even then I prefer to make all my spice powders at home. I just pick up the best quality spices. Most times I use the organic spices to make garam masala, then roughly scan them for debris.Later measure and make a powder. Please read the complete post on how to clean spices and make garam masala powder. Punjabi garam masala powder goes great to make everyday veg and non-veg curries including all south Indian foods and North Indian foods too. Indian garam masala is a aromatic spice blend used in Indian cooking. This recipe gives you garam masala that is very flavorful. It can be used in veg and meat dishes. Store it in a air tight glass jar and use up to a few months. 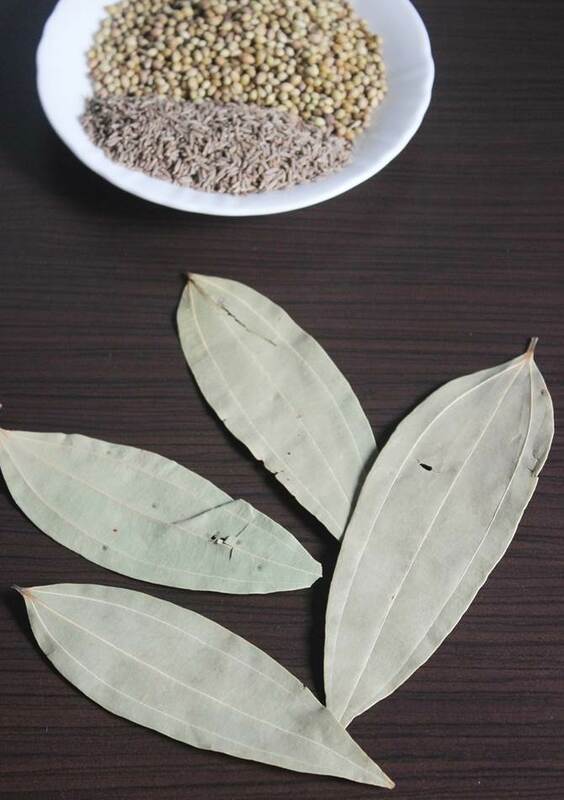 Clean the bay leaf and inner part of cinnamon stick with a dry or damp cloth to remove dirt and larvae. Break open the nutmeg and check for worms. Pick and discard stones and debris from all the spices. Sun dry the spices in hot sun for a day. Or Heat a pan on a low flame. Add cardamoms, bay leaf, star anise, nutmeg, mace, cinnamon, cloves and pepper. Fry them without burning until they begin to smell good. Transfer to a plate. Then add coriander seeds and toss until they smell good. Transfer this as well. Then add fennel seeds, toss for 30 seconds then add cumin. When they smell good transfer these as well. You can also roast all of these one after the other. Transfer to a wide plate and cool thoroughly. Add all of these spices to a mixer or spice blender jar. Powder finely. Sieve and powder the coarse spices again. Then repeat the sieve. You can use up the coarse bits of spices to your tea powder. Store this garam masala powder in an air tight, sun dried glass jar. Black cardamoms give a very pungent flavor and taste. if you are not used to the strong flavor it can be reduced to 2. If you plan to use the garam masala in your everyday cooking, then use this in combination with coriander powder. Too much garam masala in your everyday foods may dehydrate your body. If you have stomach disorders like acidity, then skip cloves, bay leaf, pepper and mace. Double the quantities of saunf and cardamoms. But this does alter the flavor of garam masala. 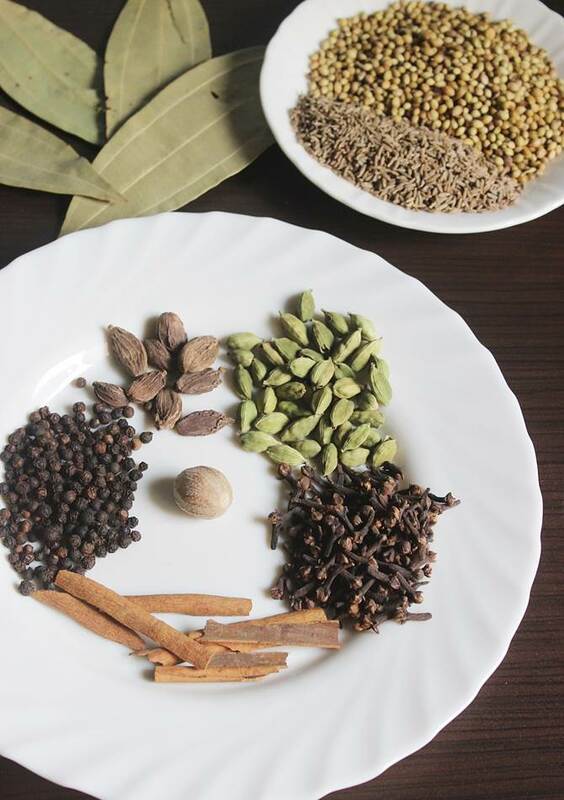 The picture below helps you to identify the spices that I have used for this garam masala powder recipe. Black cardamoms can be reduced to 2 since they really give a strong flavor. Refer notes on the recipe card for more info on it. One can even add a star anise and 3 to 4 strands of mace to make this a bit more stronger. As i said it is again a matter of choice. 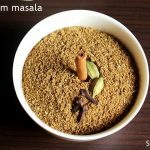 This garam masala powder recipe yields quite flavorful powder and an addition of even a small quantity brings in good flavors to any dish. 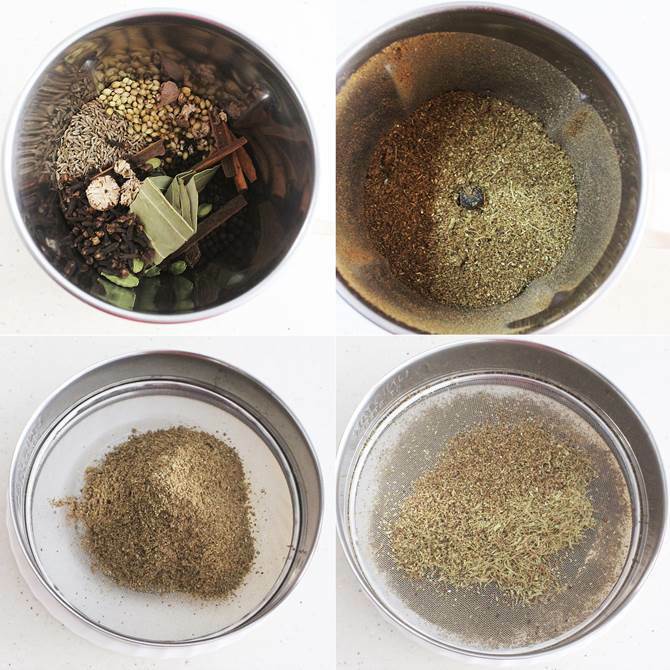 Though i have earlier shared spice powders like rasam powder, simple garam masala powder recipe, biryani masala powder and pav bhaji masala, i have never wrote a detailed post on how we generally clean the spices at home. Cleaning the spices thoroughly and sun drying or roasting is very important for hygienic reasons even if you are using organic spices. In fact organic spices are more prone to infestations which are not chemically treated to meet the organic food standards. 1. Stones and debris have to be picked from all the spices first. 2. We generally crush few coriander seeds to check if there are worms inside. Yes many a times we can find them even if picked up from the cold storage. 4. The most important spice cinnamon comes in 2 varieties. 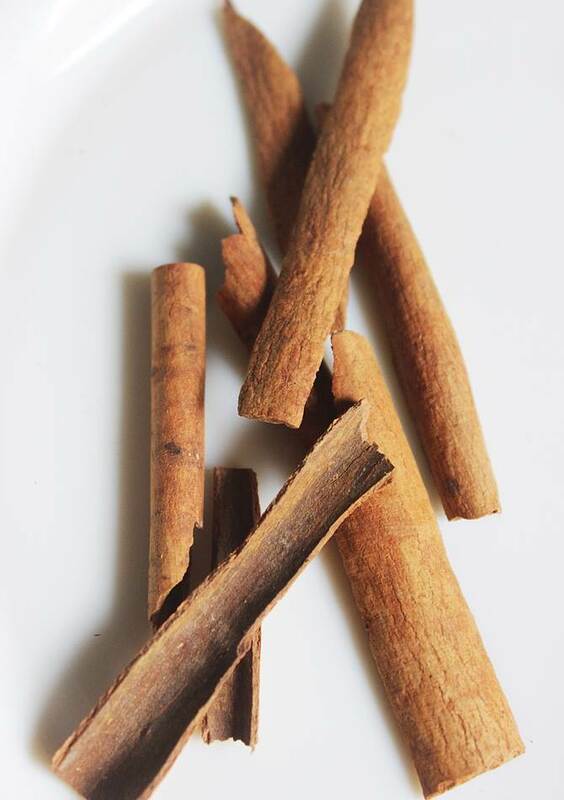 Real or ceylon cinnamon has to be used and not cassia cinnamon which is bad for our health. You can read more about choosing real cinnamon here. 5. Bay leaf too could have deposits of mud or larvae behind the leaves. wipe off with dry or damp cloth. 1.Clean up all the spices as mentioned above. 2.Spread the spices on a clean thick cloth or multilayered cloth and sundry for a day, preferably in the hot sun. For those who do not like or do not have the option to sundry, you can roast them lightly. If roasting, roast one after the other all the spices. Do not roast together, spices like cumin could get burnt. 3.Cool them thoroughly. To know what I did check the tip below. 4.Add all your spices to a jar and make a fine powder. Sieve and then powder the coarse particles again. Repeat the sieve and then set your coarse particles aside to mix in your tea powder if you like else discard. 5.Store it on an airtight glass jar. Tip: May be this is not the right way to blend a spice mix but I love this method to speed up the process. If I have time, i roast the spices on a pan or if iam in a hurry, I just go ahead without roasting. Cool them. Whether roasted or not, just keep them in the freezer for few hours to chill them. Transfer them to the blender jar and powder it. You will be surprised at how fast the powder gets done. The color of the garam masala powder could slightly vary depending on the kind and quality of spices used. This is the sieved powder made from 2 batches. The day i made this there was a bright sun light all over house, hence you see different shades. update: Recently I have also started to use saunf in this recipe as it balances the heat and pungent flavor, also makes it more aromatic. AS i mentioned, even a pinch of this makes any food flavorful, But if you are using to make any spicy curries, biryanis, veg curries, paneer recipes or meat curries, then half to 3/4 tsp of this with an equal amount of coriander powder goes right for a 3 to 4 serving dish. If you do not have the habit of keeping coriander powder separate, then you may make it together just by increasing the quantity of coriander seeds in this recipe by another 1/4 to 1/2 cup. Swasthi, I recently discovered your site and everything I have tried from your site has been fantastic. Even the really simple dals have such great flavor and balance. Thank you so much for sharing your culinary expertise with everyone. Thanks a lot for the comment. Very glad to know the recipes came out good. I need to know that can I use Caraway Seeds instead of normsl Cumin seeds as Caraway seeds are more flavorful than normal Cumin seeds. Thank you Swasthi for your opinion. Another thing it that do you have any PDF file of your recipe so that I can follow in off line. Every time it is not possible to remember the recipe as I am not a chef. For this reason I asked for PDF. if using cinnamon powder. it needs to be roasted? You can skip heating it. After you turn off the stove, just add it to the hot spices. We usually roast the spices for shelf life and to bring out the aroma. I have keya Sri Lankan cinnamon powder. can I use that instead of cinnamon sticks. and how much? Could you make a YouTube video. It’d be really helpful for us all. Yes it is 6 to 8 pieces, each of 2 inches length. I will update the recipe in detail. Thank you very much. Can I use this Garam Masala Mix in your Butter Chicken Recipe (Murgh Makhani)? If so, how would I go about using it? Fantastic ! It came out very well .. Thank you so much Swasthi for sharing the recipes in simple and step by step manner. The Aroma and Flavor is amazing .. Looking forward to try out your other recipes ! Hi .. I recently got to know nutmeg and mace can cause harm than good if consumed in large amounts. I prepared this with 120 ml cup and took all mentioned ingredients in half amounts mentioned except for Nutmeg which I took in the mentioned quantity. Now I m wondering if I should discard the preparation and prepare it fresh. Ur suggestion plz .. Yes as you mentioned nutmeg and mace are harmful if taken in large quantities. Even cloves, cinnamon, dhagad phool (stone flower), nagakesar, bay leaf if consumed in excess especially in the powdered forms are dangerous. That’s the reason it is good to follow a agreeable & correct proportion for garam masala powder. You dont need to discard the powder, just make another batch of it with out nutmeg and mix it with the already existing garam masala. It will balance. Hi can i use nutmeg powder.if yes how much? Thank you Swasthi for sharing the tips about washing and drying spices. I learnt a lot from your posts especially about the Ceylon cinnamon. What do you recommend for routine spice blending? I’m using a glass blender now. It does a poor job, leaving chunks and it has to be replaced every 2 – 3 years. Am thinking about buying an Indian type mixie or processor (the one with 2-3 sizes of cups) to blend my wet and dry spices. How durable are these? I’m in Singapore too. Realised you were based here too from another of your posts. I’ve been wandering into Mustafa Centre a lot lately, all the spices, lol. Thanks so much for the real world experience with these grinders; your recommendations will be very useful! So glad to know you too live in Singapore. Yes Mustafa is one stop center for all spices. I too buy from there. It was very informative and useful. Came to know for the first time to check coriander seeds. Yes do try and keep writing. Thanks a ton for all the good wishes. They mean a lot to me. I made some recipe from you’re taken it.. It is very tasty & Delicious..
your above tip it would be very useful.. I have to prepare and use.